Leading renewable energy consultancy group, Natural Power, has achieved a world first in demonstrating matched performance of its continuous wave wind lidar, ZephIR, to a calibrated wind tunnel as part of a Danish National Advanced Technology Foundation (DNATF) project with Denmarks National Laboratory for Sustainable Energy, Risø DTU, global manufacturer of wind turbines blades, LM Wind Power and optical and laser solutions provider, NKT Photonics. ZephIR 300  a lidar system for measuring wind speed and characteristics from ground level up to 200 metres – was deployed in LM Windpowers wind tunnel in Denmark and successfully measured wind speeds from 5m/s to 75 m/s with an averaged difference of just 0.4% for a sustained period of time and across all measured speeds. To the companys knowledge, these are the first reported tests in the world to accurately measure the performance of a lidar in a wind tunnel and help demonstrate ZephIRs ability to measure low and high wind speeds for wind resource campaigns in the renewable energy sector. These successful test results feed in to the DNATF project Integration of Wind LIDARs in Wind Turbines for Improved Productivity and Control. They also demonstrate the performance of a sister product of ZephIR 300 developed by Natural Power called ControlZephIR which is based on a ZephIR but with different system software and mechanical housing to allow the unit to be either spinner or nacelle mounted. ControlZephIR provides wind turbine control systems with the necessary data from a number of distances in front of the turbine. It is this data that allows the turbine to steer in to the wind to maximise performance but, more importantly, steer out of the wind safely in high gusts or turbulence aimed at reducing through-life costs of a wind turbine generator due to operations & maintenance downtime. Ian Locker, ZephIR MD within Natural Power commented: We are very proud to be supporting Risø DTU, LM Wind Power and NKT Photonics to demonstrate how ZephIR can be used to improve wind turbine control. These independent results show that whether ZephIR is looking forward for turbine control, or looking up for resource measurement, the system is highly accurate and can actually match the performance of a calibrated wind tunnel. By the end of the year we will have accumulated over 2.5 million operational hours on ZephIR systems globally, and we will also be launching a full commercial ControlZephIR system which has already undergone extensive testing across prototype installations in 2003, 2009 and 2010 and is currently being mass produced in the UK prior to roll-out. 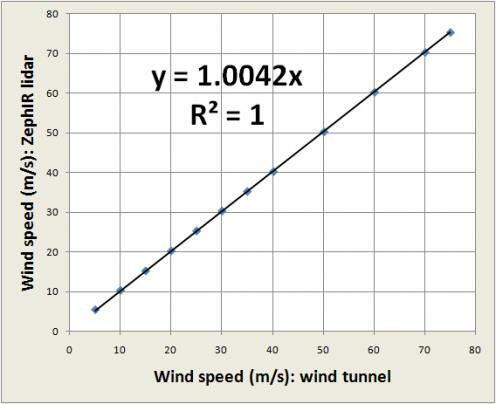 The LM Wind Power wind tunnel is a closed circuit wind tunnel with a closed test section with flow driven by a 1MW fan. A flow speed of up 105m/s can be reached and the good flow quality is achieved with aerodynamically treated corner vanes, a honeycomb structure, 3 screens and a nozzle with a contraction ratio of 10 to 1. The test section is 7m long and has a cross section of 1.35m of width and 2.7m of height.